A South African bestseller now in its 6th reprint. Also available as an e-book through Amazon. It is increasingly obvious that the world into which our young children will enter as adults, somewhere between 2020 and 2030, will be nothing like the world their parents grew up in, or even the world we currently inhabit. We need a better understanding of the world of the future in order to prepare our children in a relevant way and to ‘future-proof’ them. 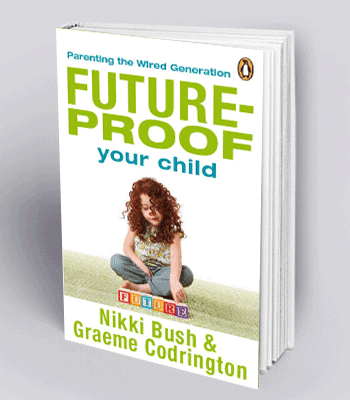 Future-proof your Child is a very different kind of parenting book. While it contains many useful practical hints and tips, it also focuses on the context for parenting and child development today. It convinces 21st-century parents of the essential need to change their approach to parenting future generations. This book will assist you to create a framework for your parenting experience as you embark on the highly personal adventure of raising children who will thrive in the future. It is relevant, accessible, practical and inspirational. It will take you back in time and forward into the future to help you make the best choices for your children now! Future-Proof your Child highlights the critical importance of making choices, having conversations, and consciously connecting with tomorrow’s children today. Creative parenting expert, Nikki Bush, is a skilled speaker and writer on child and parent development issues. She also presents popular workshops, designs educational games and judges toys. Her passion for play and connection is the driving force behind her work, which empowers parents to become more creative and effective personally and in their role as parents. Nikki is well known for offering real, relevant and practical parenting solutions, and as a sane voice in a world of confusing choices. Nikki is the proud mum of two boys. Dr Graeme Codrington is a full-time strategy consultant with TomorrowToday.biz, a company he co-founded, as well as an author and professional speaker. He is an internationally recognised expert on corporate talent and the future of work, and speaks to over 100 000 people in at least ten different countries every year. Graeme is also well known for his work on generations, covered in his first two published books Mind Over Money and Mind the Gap. Graeme is the proud dad of three girls.